It was probably a coincidence, but at the same time, Ahsoka had been around long enough to know that coincidence and the Force rarely went together. There was always some sort of link. OMG, WHAT ARE THE ODDS?! (Never tell me the odds!) The Force is to Star Wars books what London fog is to cozy mysteries, and the number of Force non-coincidences in this book is high. 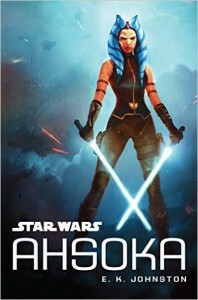 Blatant for(c)eshadowing aside, I was hoping for an entertaining account of what Ahsoka got up to between her last appearance in The Clone Wars (which I absolutely recommend watching before reading this novel) and her first appearance in Rebels, and this delivers. Mostly. The climactic confrontation was a bit meh. Based on this book, I’d say writing action isn't E.K. Johnston’s strong suit. Her characterization is pretty good, though, so I’m looking forward to her upcoming Padmé novel.